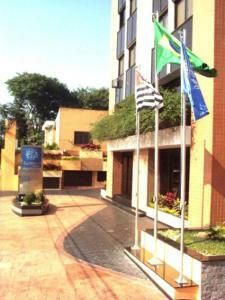 Campobelo Plaza Hotel, Sao Paulo discount hotels and accommodation. Campobelo Plaza is a Flat/Hotel with a complete hotel infra-structure, customized services at international standards for its clients. Localized close to Moema, at an exclusive neighborhood in the southern part of the city, between Ibirapuera Shopping Mall and Congonhas downtown Airport, and a few minutes away from Ibirapuera Park, the largest green area in the city. View photos, room descriptions and make online reservations at Campobelo Plaza Hotel. Save on room prices at Campobelo Plaza Hotel, Sao Paulo.